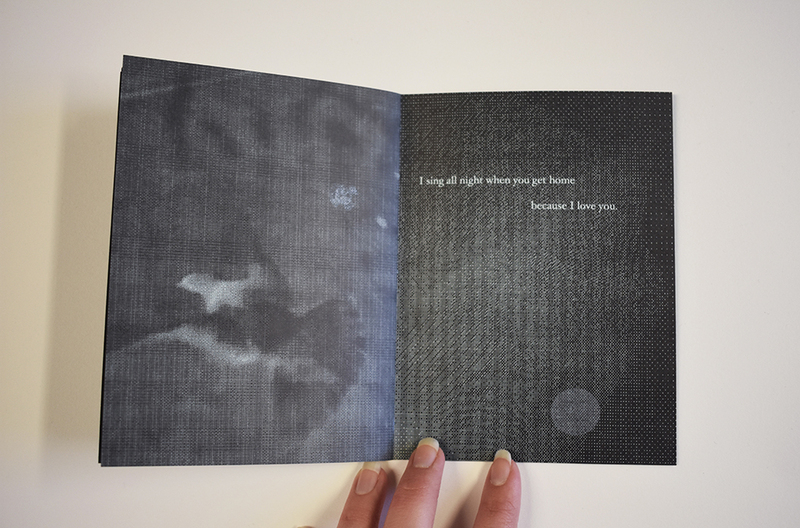 Lizzy Arden is a visual artist working in Philadelphia, PA. She is currently a candidate for an MFA in Book Arts + Printmaking at the University of the Arts (May 2019). She grew up in San Diego, CA and began printing while studying for her BA with emphasis in Painting and Printmaking at San Diego State University (2016). 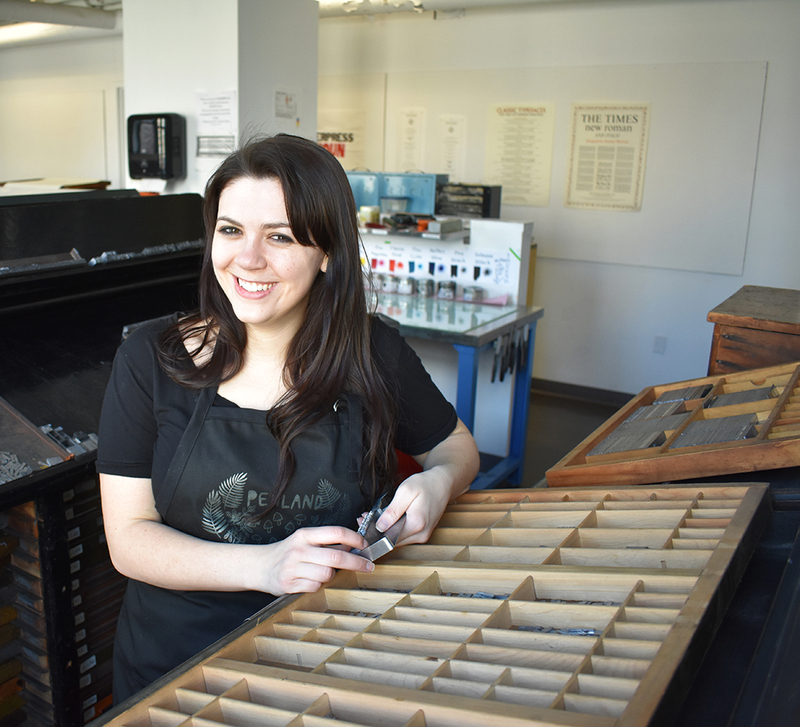 She worked as a lab assistant in the silk screen studio and completed an internship at Brighton Press before pursuing her masters. 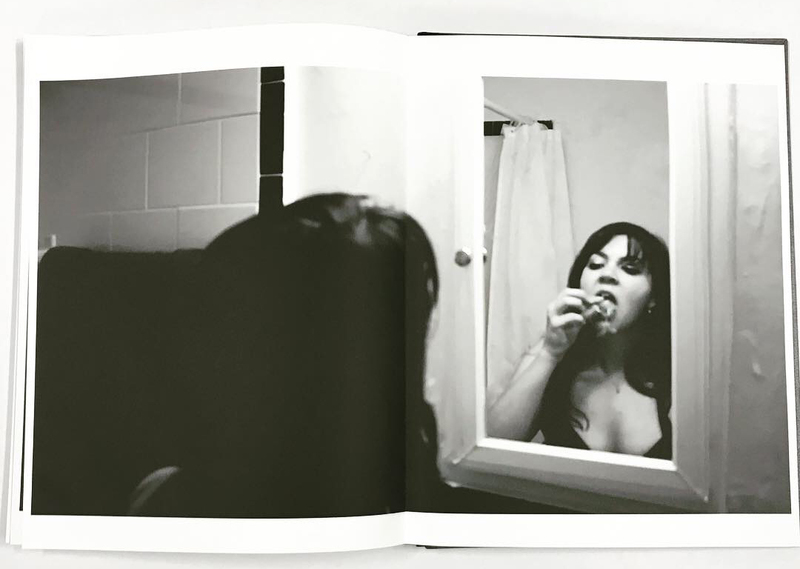 She makes work that explores the psychological issues and influences affecting women’s self-images, identities, personal relationships, and roles in society, as well as the consequences women face when departing from perceived societal norms. 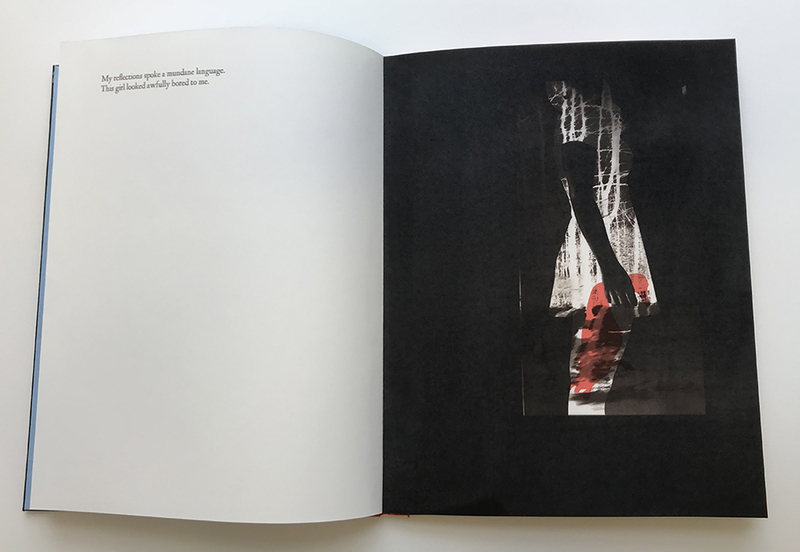 She combines text and images that relate to these struggles, focusing, in particular, on the individual experience and perspective on these matters. It is important to her that she expresses and brings to light these common issues that women still face today in the United States. She addresses subjects of the current third wave feminist movement and mental disorders that arise from these challenges that affect both men and women. Having grown up in a family that admires antiques, oddities and rock & roll music from the 60s and 70s, I was encouraged to think in unconventional ways growing up. As a teenager, I quickly became interested in counterculture movements. Musical genres such as grunge and punk rock caught my attention, as well as literature classics that challenged organized thought like 1984, A Clockwork Orange, and The Bell Jar. These interests and experiences guided me to discuss the issues that I feel affect me as a woman and as an individual. I grew up in a split household. I lived with my mom in the city for part of the week and the rest of the time I lived with my father, stepmother, and my two stepsisters in the country. These experiences led to my interest of split landscapes and household standards. Nature has always been a huge influence, but often remains a backdrop or metaphor in my work. I have turned to using my own body as the subject in my work. By using images of my body, it forces me to work with my flaws and characteristics of my appearance that I find irritating while also giving myself control over the image. 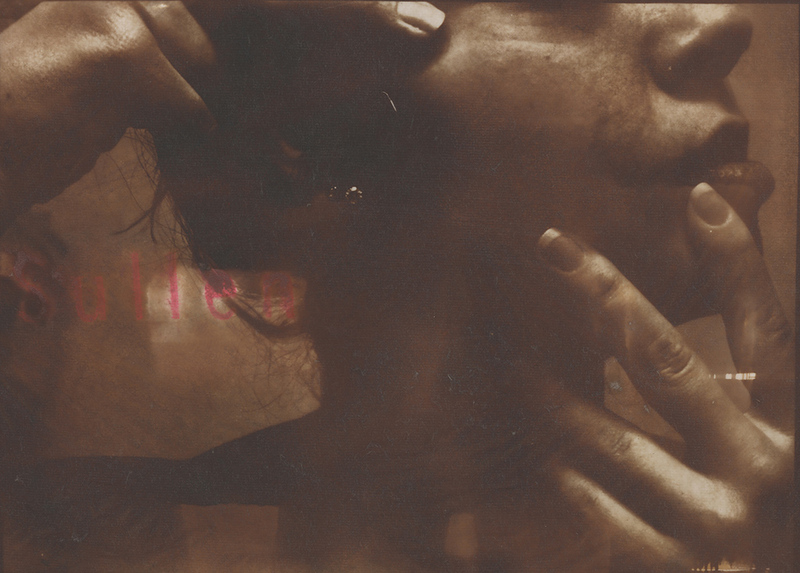 This allows me to bend reality and create imagery about women and their battle with society. For my prints and artist’s books, I combine non-silver photography, such as Van Dyke brown, papermaking, printmaking, and letterpress-printed elements. Working in layers makes sense to me as an artist as it mimics emotions. Our emotions run deep in us and are usually not easy to explain, even through the use of language. Emotions intermix with our memories to create something unique and utterly unexplainable. One of my biggest fears is succumbing to society's expectations of what a woman should be. I fear falling into a cookie-cutter lifestyle that will result in feeling incomplete as an individual. My way of coping with these fears, feelings, realities, and pressure, is creating artwork that speaks to my thoughts about a woman’s role in society. By speaking out, I hope that these issues will be brought to others attention and society as a whole can move forward in a better direction for all. Reflections, portrays the warped perception of oneself and embodies the recurrence of pessimistic thoughts. 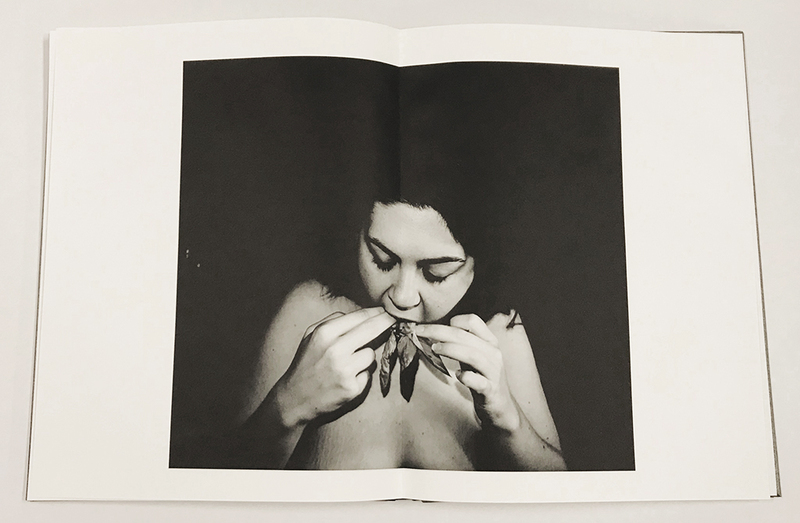 Throughout the text we see the subject continuously consume and regurgitate the plant. It shows a progression of the struggle of letting an addition become stronger and stronger no matter how painful. Thus, symbolizing many things, not just depression or literal bulimia. 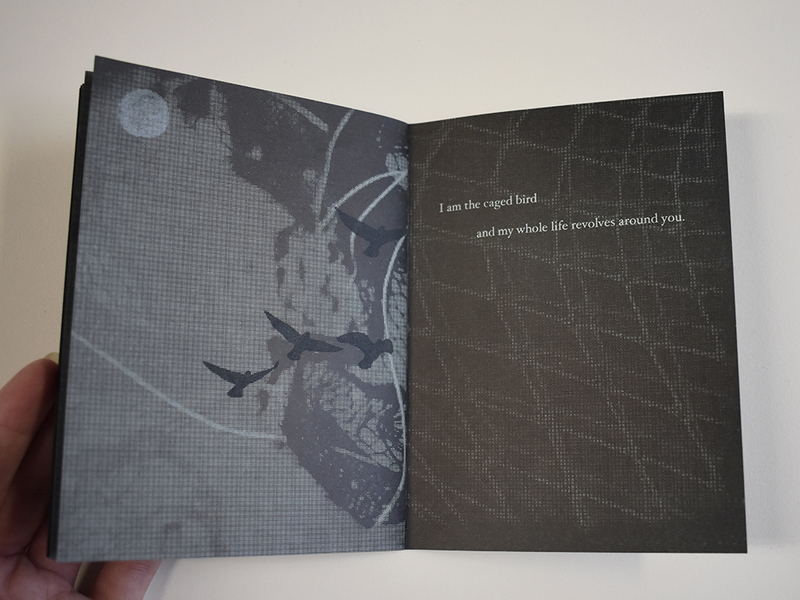 Intermixed between spreads there are excerpts from, Wallace Stevens’ poem “Thirteen Ways of Looking at a Blackbird”. 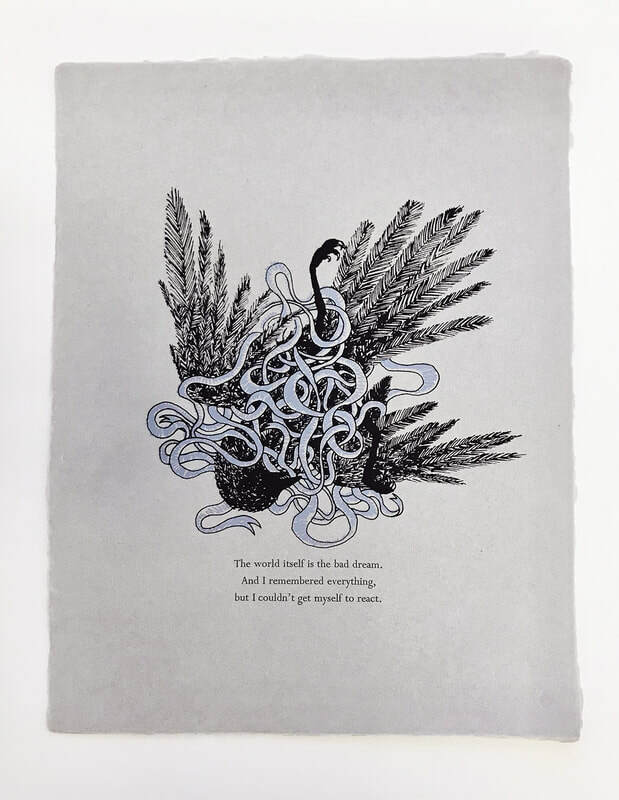 The text was chosen because it positions the reader at multiple perspectives, requiring the reader to look at things differently, as well as for its historical symbolism for comparison and all of the gray areas in between. 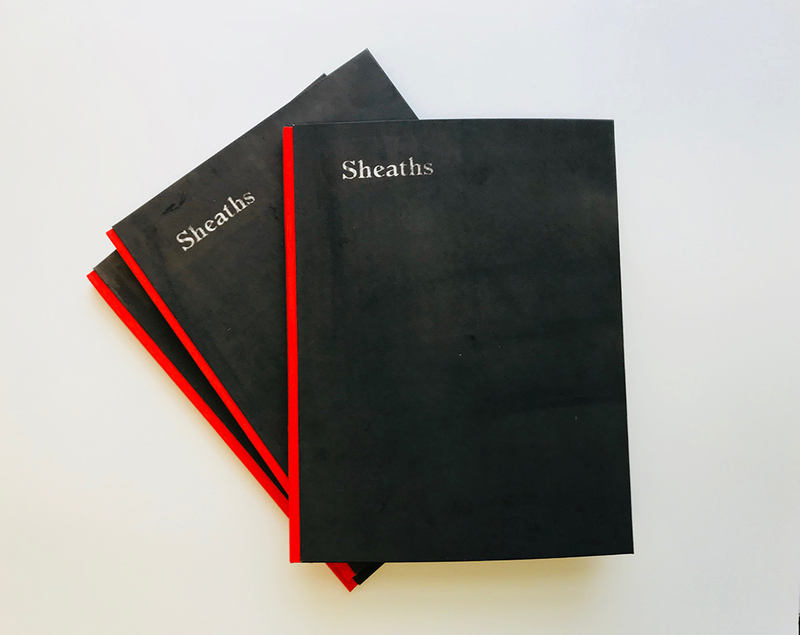 Sheaths is about revealing the covered and suppressed areas of the mind and the themes of accepting or suppressing the second self within. In this book, I represent my two selves in the form of a red duck and abstract Van Dyke prints of myself. When I use the bird or multiple birds in my work it is to represent myself. I do this because of my personal connection and obsession with these animals. I use them for their beauty, their symbolic nature of freedom, and their loyalty to their owners. 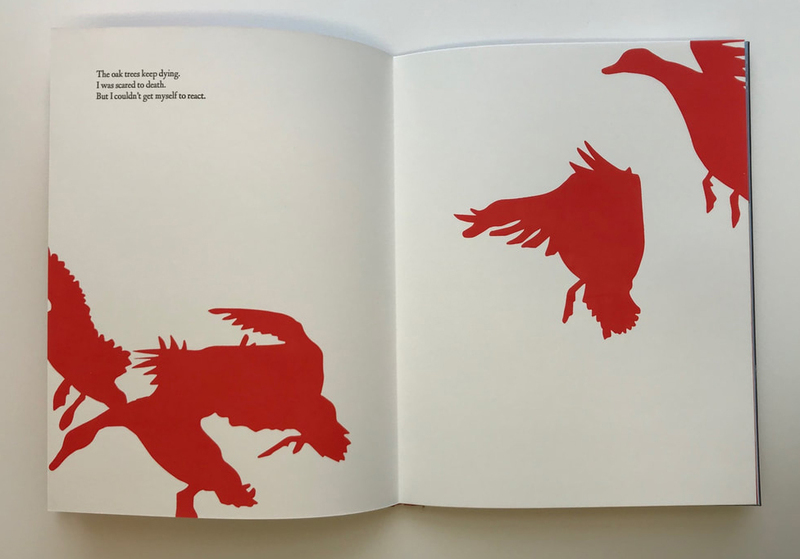 In this book, I use a duck because of the connection to water and hunting. Their feathers often echo their environment in order to camouflage themselves from predators. Moreover, they normally live in still waters that reflect the space around. I find these themes relatable because I often I try to camouflage myself from others by my appearance. The theme of reflection is interesting to me because of how it casts reality. Yet, sometimes our perception is altered, and we don’t always perceive the same thing as everyone else. Psychological disorders relate to this topic as well.